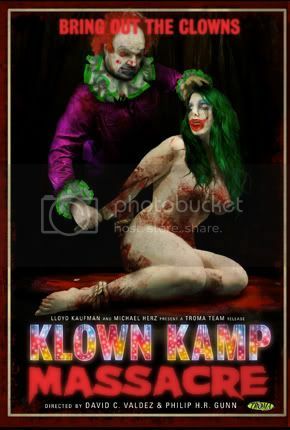 Coming December 13th from Troma, Klown Kamp Massacre is a low budget horror film using one of the most tried and true subjects in horror - CLOWNS (or in this case, KLOWNS). I was lucky to have a childhood where clowns didn't plague my nightmares but I know plenty of people who did and it wasn't pretty. Having to avoid the circus and anywhere else a clown might pop up doesn't sound like a fun childhood for me. Klown Kamp Massacre isn't your typical killer clown movie though. Read on and see what I mean. The best way for me to describe Klown Kamp Massacre is to call it Friday the 13th with clowns. Basically an aspiring clown named Edwin gets ridiculed many years ago at a clown camp and then goes on a killing rampage, offing all of the fellow clown campers. Now, it's the present and the clown camp is being reopened by an aging clown named Bonzo. Edwin makes his way back to camp and starts knocking off the clowns in training, one by one. Klown Kamp Massacre has a good mixture of horror and comedy. The death scenes are expertly done with scalpings, sliced throats, beheadings and several more grisly sights to make your stomach turn (the blown off face and the headless female clown are two stand outs). The use of practical effects (as opposed to CGI) really makes a difference in delivering the gory goods. The film also benefits from an over-the-top script using silly characters (they are clowns remember), juvenile humor and zany sound effects. One other pleasant surprise was the quality of the cinematography. It seems like a good HD camera was used and the directors were obviously schooled in their craft so the film definitely looked better than what a paltry budget usually delivers. Throw in a twist ending, a spoof (or was it?) on the whole rapping clown/Insane Clown Posse scene, some clown fornication and Lloyd Kaufman and you have a funny, gory, well made horror film. Obviously this isn't high art, but it's watchable and entertaining if you're looking for something different in the over-crowded horror genre.